Save more than 10%. As long as stocks last. 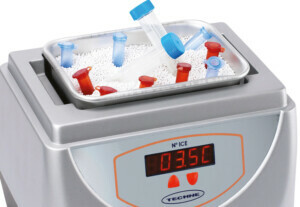 N°ICE Electronic Ice Bucket is ideal for chilling or incubating any number or size of tubes for long periods of time. Instead of the normal situation in the laboratory with tubes floating in melting ice, the N°ICE ceramic-coated beads maintain the temperature and support the sample vessels for as long as necessary. The beads are chemically resistant and if required can be autoclaved at 134°C. As a time saving option, the bucket of beads can be incubated in the fridge overnight and simply inserted into the unit as and when required. The unit features our Isotemp® temperature control zone that ensures that all contents of the unit are kept at an even temperature, whether cold or warm.